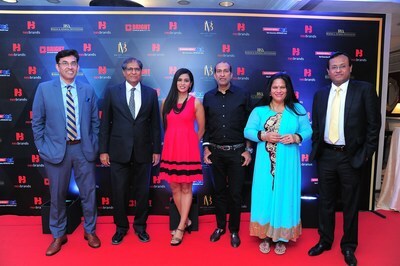 Noted brand strategy consultancy Nexbrands Inc recently hosted the fourth edition of the Brand Vision Summit at the swanky ITC Grand Maratha Hotel. The annual summit fetes individuals who are powering India’s progress across sectors. In the felicitation ceremony, 50 noted personalities and brands were honoured with the trophy of ‘The Extraordinaire‘. These people have consistently broken all the boundaries and have placed the consumer at the center of all their thoughts. The event was preceded by the exclusive cover launch of the third edition, The Extraordinaire coffee table book. The book documents the winners’ journeys, challenges, case studies, achievements and philosophy. The book was launched by spiritual leader Gaur Gopal Das; Mr. Sunil Aggarwal Chairman and Managing Director, Kamdhenu Group; Mr. Sharad Maheshwari, Chairman, SM Group & Nexbrands; Ms. Chandrika Maheshwari, Jt. Managing Director, Nexbrands & founder, Brand Vision and Mr. Saurav Dasgupta, Jt. Managing Director Nexbrands & Co-founder, Brand Vision. The glittering award ceremony had a panel discussion. Industry leaders such as Chetan Shah, Vice Chairman, Marathon Realty; Sunil Agarwal, Chairman & MD, Kamdhenu Group; Rajneesh Bhatia Vice Chairman Trident Group; Anjana Ghosh, Director, Bisleri; Sumit Chauhan, Country head and VP India, Harman Kardon, to name a few, discussed topics such as ‘Ease of Doing Business: The Impact of the jump’, ‘Sustainability – A Key to Survival’ and ‘Unleashing Leadership and Innovation’. Mr. Sunil Aggarwal – Chairman and Managing Director – Kamdhenu Group is delighted to be associated with Brand Vision. He said, “It’s an inspiration to see India’s very best leaders and personalities in the same room. The Brand Vision Summit has, in the past, felicitated many heroes so it is very humbling to be able to contribute to the vision of the organisers who have worked relentlessly towards building this up in such an iconic property. Kamdhenu Group is built by amazing people who have put in a lot of hard work to make the group reach it’s pinnacle and hence, we understand how much sweat and play it takes for any brand or a personality to be recognised at such a platform. Sumit Chauhan; Vice Present and General Manager – JBL By Harman, HARMAN International and JBL as a brand are pioneers in the Music & Sound industry. The history of modern music industry and JBL almost coincides across decades. It has been our endeavour to deliver the best sound experience to our customers through brands like JBL. We are delighted and humbled to be part of Brand Vision Summit and thank Nexbrands for recognizing our efforts in delivering the best. We will continue to strive hard to bring innovation without compromising on delivering studio-quality sound to HARMAN’s patrons. The night concluded with celebratory cocktails and dinner. NexBrands Inc is a brand strategy consultancy headquartered in Gurgaon. Established in the year 2013, the company has seen an annual growth of close to 100% from it’s establishment and has worked with the most prestigious clients across industries Pan India. Our work is spread across various domains of marketing and brand creation ranging from corporate strategy, brand building and engagement, creative studio, event management, celebrity association, intellectual properties, in film associations et al. We have worked with more than 100+ brands and companies so far ranging from the new age startups to established giants, which has given us an extensive know how of the functionality and acceptance of a particular brand in the market which in turn helps us design solutions that make our clients reach their potential. Our tailor made solutions for companies are designed on the key concerns and focus areas of their institution be it – reaching out to their target audience or stake holders, talent acquisition, showcasing their work culture or innovation and technology etc.